On the coastline between La Jolla and the Torrey Pines Golf Course. Best during WNW to WSW winds. LJAC1 La Jolla (MesoWest), 1.7 mi. S at the end of the Scripps Institute Pier. EW3218 Del Mar (MesoWest), 4.4 mi. N in Del Mar. NOAA/NWS Local 7-Day Forecast • NOAA/NWS Zone Forecast • NOAA/NWS Area Discussion. Torrey Pines Gliderport is an active FAA-recognized airport and you must either be a member of the Torrey Pines Gulls RC Club or be an accompanied guest of a member to fly there. This rule is strictly enforced and there are serious consequences for violating the rule. 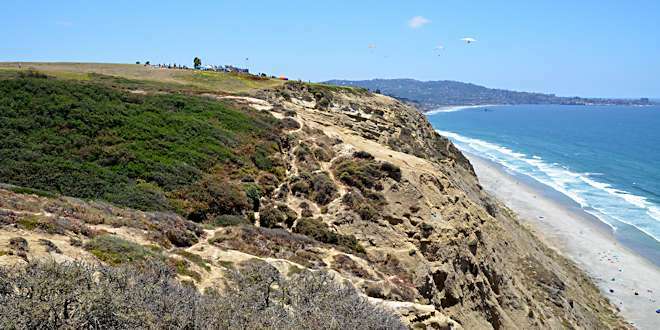 CLICK HERE for more information about the Torrey Pines Gliderport. CLICK HERE for more information about the Torrey Pines Gulls RC Club. EXIT Freeway at Genesee and head W towards the ocean. If you’re going north on the I-5 you will need to cross over the freeway after you exit. Go aprox. 3/4 mile on Genesee to N. Torrey Pines Rd. and turn LEFT. Go aprox. 3/8 mile to on N. Torrey Pines Rd. to Torrey Pines Scenic Dr. and turn RIGHT. Go aprox. 1/4 mile on Torrey Pines Scenic Dr to the cul de sac. Go straight through the cul de sac into the Torrey Pines Glider Port parking lot (dirt). 32.88709, -117.22773 • Junction of I-5 and Genesee Ave.
32.89189, -117.24032 • Junction of Genesee Ave. and N. Torrey Pines Rd. 32.88771, -117.24374 • Junction of N. Torrey Pines Rd. and Torrey Pines Senic Dr.
32.88985, -117.25115 • Torrey Pines Glider Port.